If you’ve fallen victim to a weak or old kingpin, you may have noticed your truck breaking into two parts recently. If you’re wondering if it’s possible to continue to use them, you’ve come to the right place! If you uninstall the halved truck from your skateboard, we’re betting that you’ll find the bottom half of the broken kingpin hiding underneath your truck. If this is the case, grab a hammer and go ahead and gently knock that old kingpin out of the truck’s base plate. If your kingpin is broken with the bolt stuck inside of the base plate, simply knock find an object (preferably a flat head screwdriver) and hit it with a hammer until it falls out. Now that your old kingpin has been knocked out, you can now install that shiny new kingpin. The easiest method for installing a kingpin that we’ve found is to take two bricks or cinder blocks and set them beside each other, leaving just enough room to support the truck’s base plate on each side. Set the base plate upside down between the two supports and insert the new kingpin. It should be a tight fit, so you may have to tap it into place using your hammer. 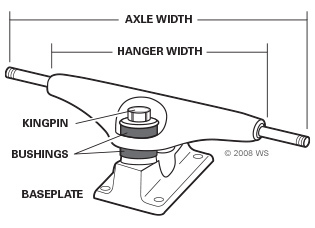 Once the kingpin has been pushed all of the way in, go ahead and assemble the remaining bushings and hanger. Tighten the kingpin nut so that it feels fairly the same as the other truck. You may have to give your skateboard a few pushes and continue tightening the kingpin until your board rides straight.